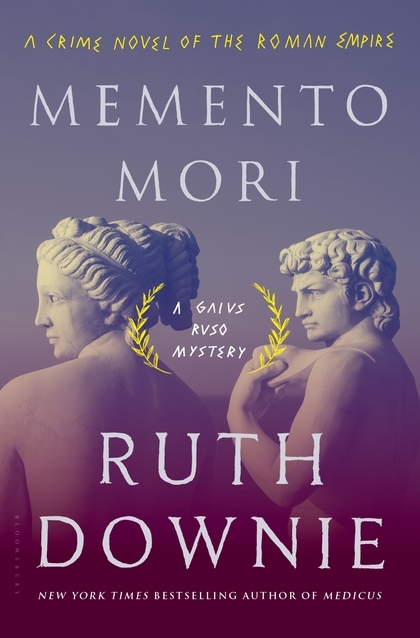 Tragedy strikes close to home in Ruth Downie's new novel Memento Mori, the eighth in her series featuring medicus (think one part medical man and nine parts very skilled butcher) Gaius Ruso and his wife Tilla: the wife of Gaius' best friend, Valens, has been found murdered in the allegedly healing waters of the sacred hot spring in the town Aquae Sulis – modern-day Bath. The town priests and politicians had built the temple around the spring and, in an attempt to ease frictions between the English and their Roman conquerors, had given it a hybrid name intended to honor both the Roman goddess and the local deity. Ordinarily, townspeople contented themselves with throwing small metal tablets containing curses into the hot waters of the spring; the discovery of a body would be a catastrophic scandal as well as a tragedy and a crime. Downie unfolds the investigation at her customary smooth, deliberate pace, filling her pages with well-realized characters … the least obtrusive of which is the hot spring itself, which was the center of the city long, long before Jane Austen came along and made the whole place famous all over again. In remarkable Author's Note, Downie mentions that although the incredible original site of the temple is no longer suitable for bathing, it's still possible to take the same waters the Romans took: the hot springs feed nearby spas that are very much open for business – even if Gaius Ruso isn't around to sleuth any boiled murder victims.